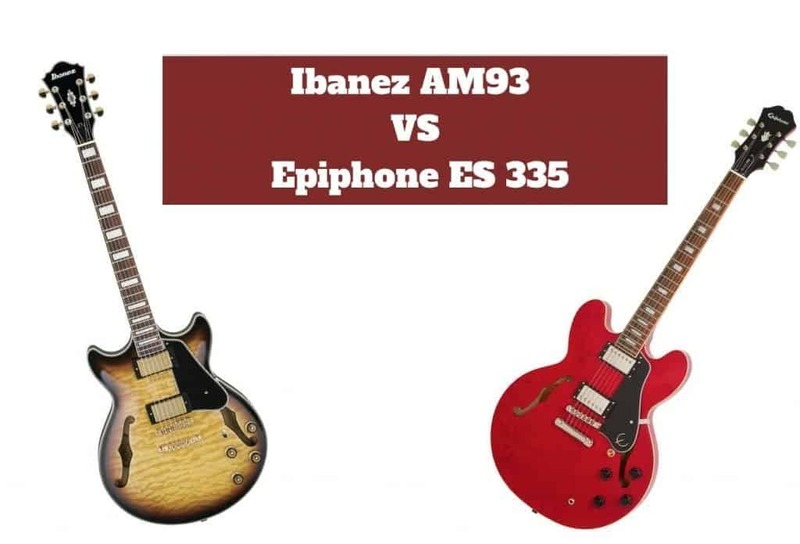 » Ibanez AM93 vs Epiphone ES 335 – Semi-Hollow Body Guitar Battle! Ibanez AM93 vs Epiphone ES 335 – Semi-Hollow Body Guitar Battle! From sweet melodies to wild tones, semi-hollow guitars have always held a special place in the world of Western music. And, that’s one reason why the Ibanez AM93 vs Epiphone ES 335debate is all over guitar forums and threads. Both Ibanez AM93 and Epiphone ES 335 are best-selling semi-hollow guitars on the market, and beginners, as well as professional guitarists often find it difficult to pick the best option. From Paul McCartney, B.B. King, George Benson, to John Lennon and Keith Richards, all leading guitarists enjoy recording with semi-hollow bodied guitars. Moreover, they created some incredible music on these brilliant instruments. Semi-hollow body guitars come with the best of both worlds – acoustic and electric guitars and are a perfect combination of striking visual appearance and great tonal depth. They’re highly versatile instruments that can be used to create music in a wide range of genres. However, they aren’t for everyone, and not all semi-hollow bodies guitars are exceptional. If you’re not sure about picking the best option between Ibanez AM93 (read my full review here!) and Epiphone ES 335, you’ve come to the right place. In this post, we’ll provide you with all the information you need to make an informed purchasing decision. Our guitar specialists spent almost 2 weeks to test both products and compile their pros and cons. By the end of the Ibanez AM93 vs. Epiphone ES 335 comparison, you’ll have a clear choice in front of you. What is a semi-hollow body guitar? A semi-hollow body guitar is a combination of a hollow-body and solid-body guitar. In fact, a semi-hollow body guitar looks very similar to a hollow-body guitar, but typically comprises a solid wooden block running through the guitar’s center, with hollow arms. The good thing is that semi-hollow body guitars do not come with feedback issues that are commonly found in hollow-body guitars. In fact, they’re more versatile and durable due to the solid wooden body part attached to the neck of the guitar. There have been several attempts at different types of semi-hollow body guitars from different guitar manufacturers, and not all of them have managed to develop a versatile, durable, and great sounding semi-hollow body guitar. Even some of the Gibson models are inconsistent. But, you won’t find the same problem with Ibanez. All Ibanez semi-hollow body guitars are highly-consistent. Pick any Ibanez model, and it’ll sound the same. You’ll hardly notice any discrepancy from one model to the other. The semi-hollow body guitar concept was designed and introduced in 1950 and continues to provide guitarists with distinctive tones and a wide array of models to choose from today. Why would you need a semi-hollow body guitar? Semi-hollow body guitars produce excellent harmonic fullness – a warm sound with great overtones and rounded mid-tones. 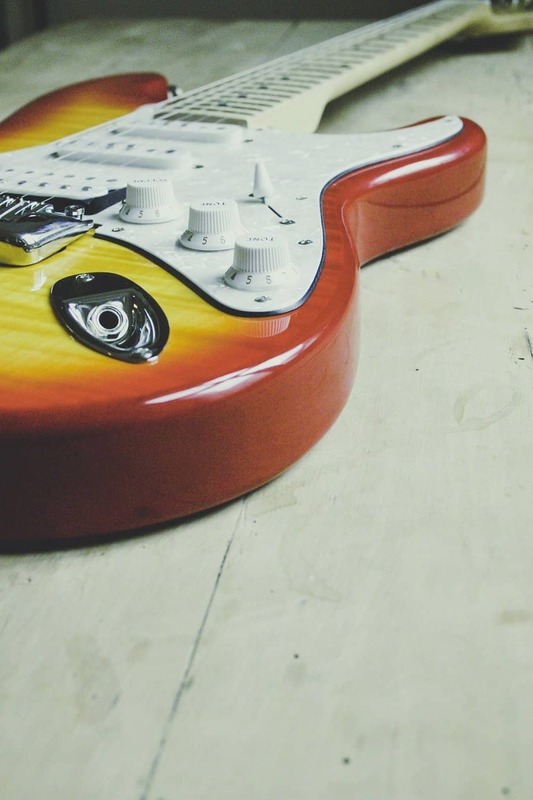 The sound is richer than the sound produced by a solid-body guitar. At the same time, there are no feedback issues like a hollow-body guitar. So, whether you’re a blues musician, a rock player, or a jazz master, a semi-hollow body guitar is all you need. The hybrid structure of a semi-hollow body guitar makes it ideal for different situations. They’re lightweight and easy to carry. Due to their unlimited amplification potential, they’re narrower than hollow-body guitars. All in all, they’re comfortable to hold and play on the stage for extended periods. The natural resonance that comes with semi-hollow body guitars makes them sufficiently loud during a practice session when they’re unplugged. So, if you don’t have a dedicated practice room, a semi-hollow body guitar can be a good option. 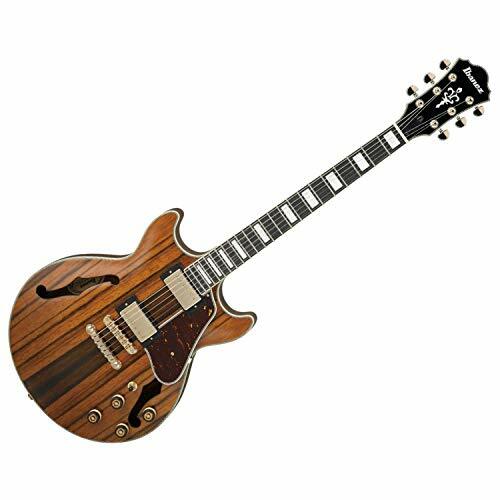 If you just talk about the looks, semi-hollow body guitars have an appearance that is symbolic of high-quality wood and excellent craftsmanship. Many guitarists simply love the traditional contours and old-school looks of semi-hollow body guitars. Are semi-hollow body guitars good? Ibanez AM93 vs. Epiphone ES 335 – Which semi-hollow body guitar is better for me? If you’re looking for an affordable semi-hollow body guitar, bothIbanez AM93 and Epiphone ES 335 are two semi-hollow body guitars you can explore. Nevertheless, there are some key differences between both products when it comes to their visual appearance, hardware, sounds, and so on. Ibanez AM93 has a large body which can be somewhat difficult for beginner guitarists to hold for a longer duration. As far as the tonewoods are concerned, Ibanez has used quilted maple of the back, the top, and the sides. The neck comes with a 3-piece mahogany and maple combination. The Antique Yellow Sunburst theme of the guitar is a treat to the eyes. Epiphone ES 335 comes with an arch-top body and soft double cutaways, made of maple and birch laminate of different thickness across the back, top, and sides. The body is painted with different colors such as Cherry, lovely Vintage Sunburst, and Classic Ebony. The mahogany neck is attached to the body and comprises a SlimTaper D profile for enhanced comfort and stability while playing. The overall look and feel of the guitar is subtle. The old-style f-holes in the lower body, the protecting cream body binding, and pearloid wedge inlays are some striking features of ES 335’s design. Just like Epiphone ES 335, instead of getting inspired from their signature vintage Bigsby configuration, Ibanez has used a standard Tune-o-Matic bridge with a stop bar. Even though the configuration doesn’t improve the guitar’s quality, it certainly enhances the overall consistency of the hardware while ensuring that the guitar is easy to use. The string action that comes with Ibanez AM93 is great for the guitar’s price. The knobs of this semi-hollow body guitar definitely deserve mention as they’re really classy and come with rubber rings to make sure you get a good grip. 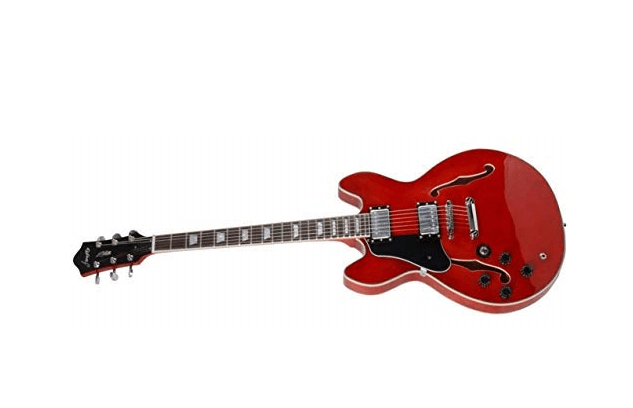 Epiphone ES 335 is tuned by two passive Alnico Classic Pro humbuckers at the neck and bridge. Both pickups designed by Epiphone are of good quality. They are controlled by a 3-way toggle selection button and individual volume. The Wilkinson Vintage Classic tuners are tulip-style with beautiful green machine heads. During the testing exercises, our guitar specialists found that the Ibanez A93 is not your regular semi-hollow body guitar. When it comes to the tone, you can expect the same pattern to keep repeating. The combination of tonewood and electronics allows you to play a broad range of genres. Jazz works really well. However, you can also connect your AM93 to Ibanez Tube Screamer and play some heavy grooves. The possibilities are simply limitless. The mere versatility of tone is the primary selling point for Ibanez AM93, without any doubt. The Custom 58 pickups installed on the guitar are responsible for it’s clear sound, crisp note definition, and heavy warmth. So, if you don’t like to stick to one genre, and prefer switching between metal, blues, classic rock, country, and rockabilly, AM93 can be a great option for you. When it comes to Epiphone ES 335, as already mentioned above, the two humbuckers are pretty impressive. Through a clean amplification, the humbuckers produce a rich sound and great warmth. Nevertheless, with some gain, the humbuckers can produce some punchy, gritty overtones that are ideal for blues. The controls and coil-splitting add more versatility. Therefore, Epiphone ES 335 can be a good option for blues players who prefer playing around with different genres and tones. The quality, fit, and finish of both products are equally good. However, AM93 looks more stylish. 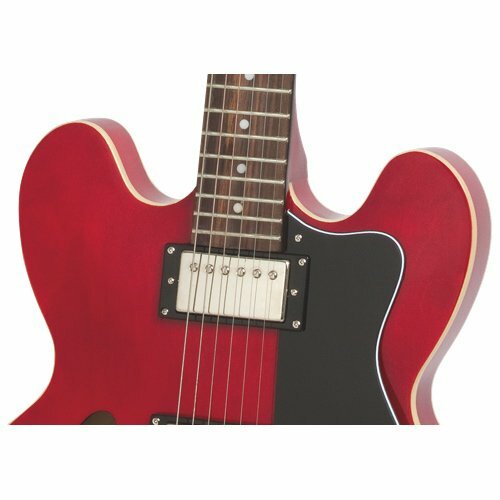 Epiphone ES 335 has better coil-split and pickup options. Both products feature a Tune-o-Matic type bridge, which makes it easy for you to change the strings. The tuners on Epiphone ES 335 are stronger than Ibanez AM93. Surprisingly, AM93 did not come with good-quality machine heads. Nevertheless, you can upgrade them from going forward. Where are Ibanez guitars made? Only the “Artcore” guitars are “Made in Japan.” All other Ibanez guitars are made in the US. Short and straight – Ibanez is a great brand. However, just like all other brands, Ibanez has high-end and low-end guitars. The best thing customers like about Ibanez guitars are their affordable prices and consistent quality. Play any Ibanez guitar, and it’ll sound the same. You can find Ibanez guitars at any price point, and it will play perfectly; just like Ibanez AM93. Which is a good guitar for beginners – Ibanez AM93 or Epiphone ES 335? 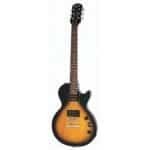 Ibanez AM93 is the best semi-hollow body guitar for beginners since it is lightweight and comfortable to hold and play for long performances. Epiphone ES 335 is not suitable for beginners as it is larger than Ibanez AM93 and uncomfortable to hold. Is Ibanez good for metal? Yes, Ibanez guitars are some of the best guitars in the world of rock and metal. Now that you know the basic differences between Ibanez AM93 and Epiphone ES 335, do you think you can make an informed choice? Don’t worry if you’re still unable to. Our guitar specialists have tried to make the task easy for you. Based on hands-on testing, we found that both products to be excellent when it comes to sound quality. However, Ibanez AM39 is more versatile than Epiphone ES 335. The latter is more suitable for blues players. When looking for the best semi-hollow body guitar on the market, always remember the “versatility is king.” If not anyone else, trust your ears and go with an unquestionably golden, unique tone. If you’re someone who loves to experiment and switch between genres, you can blindly go with Ibanez AM39. 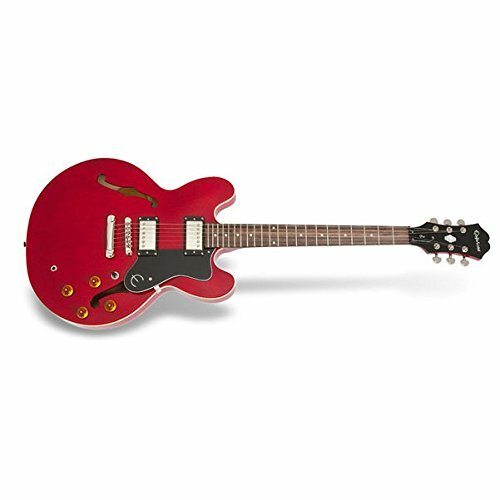 Also, Epiphone ES 335 is a bit larger in size which makes it slightly unsuitable for beginner guitar players who may find it uncomfortable to hold and play the guitar during long stage shows and performance. The size of Ibanez AM93 is perfect for beginners as well as professional guitar players. All in all, Ibanez AM93 is an affordable, versatile, and aesthetically sound semi-hollow body guitar. So, if you’re interested in buying an entry-level semi-hollow body guitar that’s also affordable, you can choose either of the two products compared here. In the end, your choice would completely depend on your requirements, genre preference, and experience level. We hope you found the Ibanez AM93 vs. Epiphone ES 335 comparison helpful. If you have any other guitar-related products in mind that you would like us to compare or review, please write to us, and we’ll share your request with our guitar gurus. They’re always ready to help guitar enthusiasts. Also, if you have more questions on Ibanez AM93 or Epiphone ES 335, you can post your queries in the comment section below. 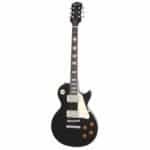 The Epiphone Dot Studio Semi-Hollow Electric Guitar: Is This Guitar Worth It?